Although you’re likely to have a surplus of candy available for the whole family to eat, practicing some restraint will help to protect your oral health. Instead of eating everything in one day, have your family members spread out the bountiful plenty over a few days or even weeks. When you sleep, your mouth will usually be partially closed, which contributes to a dry environment that is perfect for bacteria growth. Furthermore, the favorite source of sustenance for bacteria is sugar. Thus, eating candy before bed contributes to a more acidic environment in your mouth while you sleep. Whether you are preparing for bed or your evening is still in progress, it’s imperative to brush and floss your teeth immediately after consuming any candy. The longer the acid-producing sugars are allowed to cling to your teeth, the more corrosive they become. Brushing will agitate and remove leftover particles from the surface of your teeth while flossing will get into the hard-to-reach places to provide more protection for your teeth and gums. While sugar, overall, isn’t good for your teeth, there are some forms of candy that are less detrimental to your oral health. The best option on Halloween night is chocolate candy – preferably the dark kind. It will typically contain less sugar and is easier to remove from the teeth. Along with your natural saliva production, drinking plenty of water is a great way to constantly flush your mouth on Halloween night. 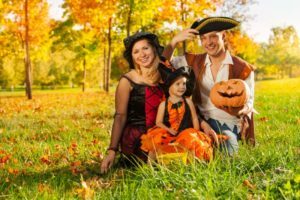 You know that sugar is not a contributor to your oral health, but with the information you have now, you and your family can enjoy Halloween without having to worry about any major consequences. For more tips on how you can maximize your oral health or to schedule the entire family for a dental wellness check, contact your dentist in Newark today! Dr. Timothy D. Ganfield is a graduate of Temple University and throughout his career, he’s remained dedicated to expanding his knowledge and further sharpening his skills. Thus, he regularly attends continuing education courses to stay abreast of the latest changes in the world of dentistry. Dr. Ganfield provides dental care for the entire family at White Clay Dental, and he can be reached for more information through his website.